The Fuller Center for Housing of Central Illinois, Inc. began in April 2007 as an effort to improve the availability of affordable housing in our area. Millard Fuller encouraged us to add to the efforts of those in our community involved in affordable housing. Our 12 member board of directors formed over the next few months and we were incorporated in June. We are an all-volunteer organization, which allows donations to be used to provide services directly to families in need. In 2007, we began collaborative efforts with other agencies in our area. Our goal is to raise awareness of the need for more affordable housing and to make decent shelter a matter of conscience and action. Small houses at minimum cost are needed in our community, but so are minor repairs and major renovations for many low-income families. Shortly after The Fuller Center for Housing of Central Illinois was formed, Habitat for Humanity of McLean County also decided that more simple, affordable housing was needed. They have decided to begin building smaller two and three bedroom houses on scattered sites throughout Bloomington and Normal. In a cooperative effort to uplift and improve neighborhoods, The Fuller Center for Housing of Central Illinois will perform repairs to qualified families’ homes in the areas where affordable housing is being constructed by three other local agencies this year. Central Illinois Fuller Center’s most recent project was for an elderly woman, Clariona Tucker who has a disability that does not allow her to go up and down steps without assistance. She also had windows in her house that needed to be framed, caulked, and painted. 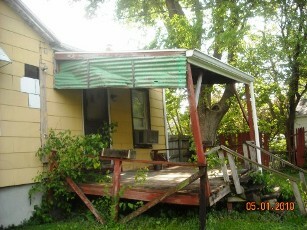 The other wood trim on her house also needed scraped and painted. 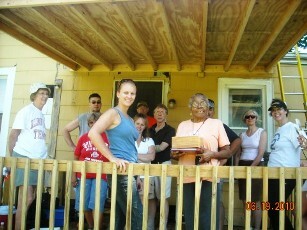 Work was done to help restore her porch to a safe and secure place for her.